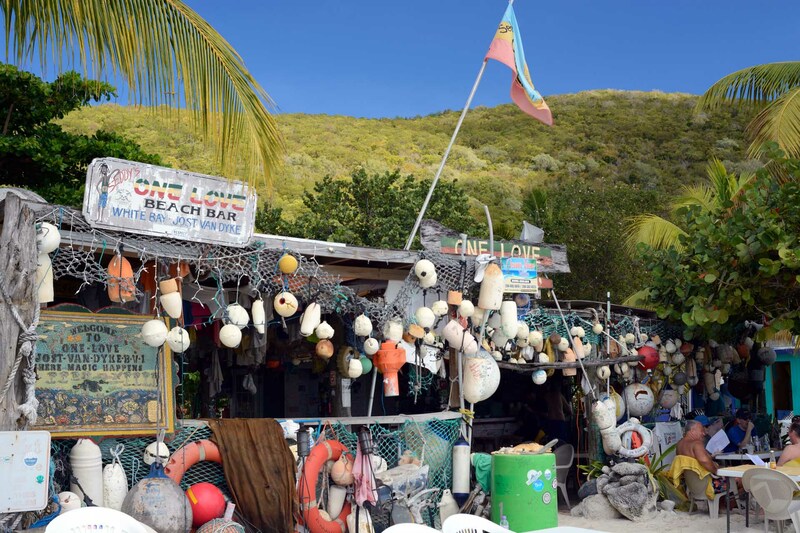 Jeff and I have fallen in love with Jost Van Dyke, an 8 square mile island in the British Virgin Islands. There, we said it. As avid travelers, I’m still floored that this place has lured us back three times in four years, but that just proves how special it is. Now that we have a couple years of this blogging thing under our belts, we are going to properly re-introduce you to the wonders of JvD. 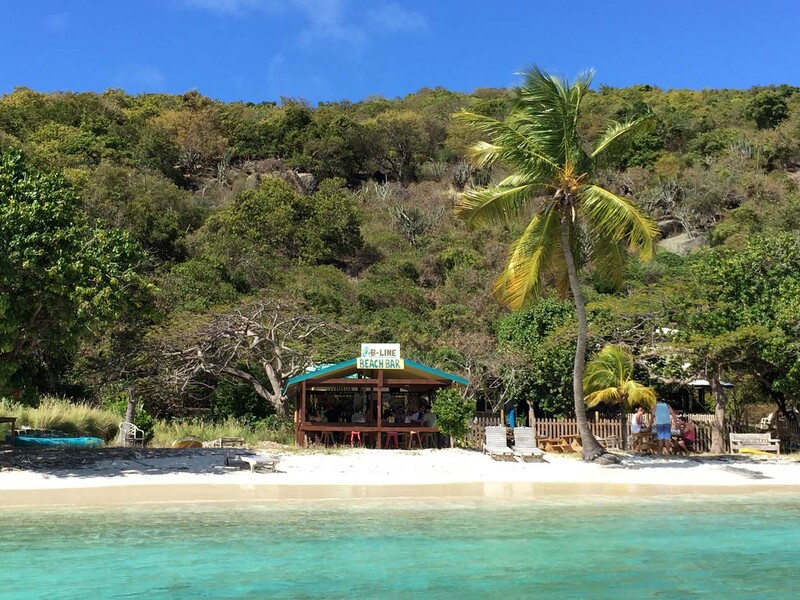 If you decide you love it like we do, see our previous post that provides tips for planning your perfect vacation to Jost. We’ll base our tour of Jost on the map below, going from west to east, starting with White Bay. 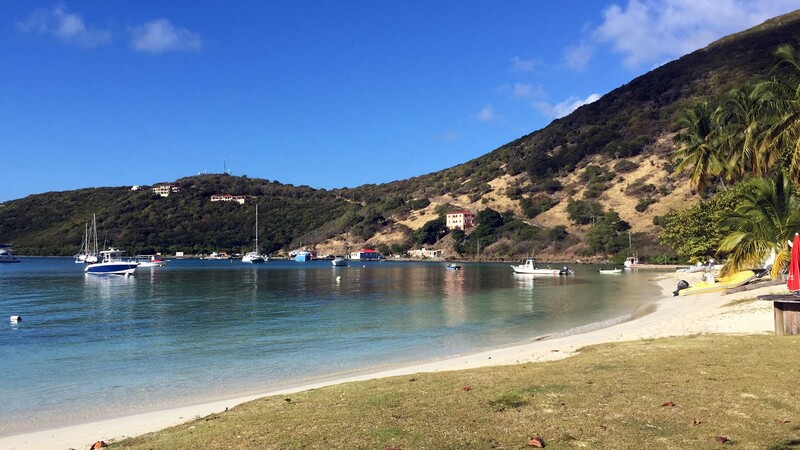 The next bay over (marked as Belle Vue on the map) is Great Harbour, then the next is Little Harbour (marked as Garner Bay on the map), then to Diamond Cay (marked as Long Bay), then Little Jost Van Dyke, Sandy Spit, and Sandy Cay. As you can see, most of the action in JvD happens on the southern side of the island since it is the most sheltered. The northern side is continually hit by waves from the Atlantic Ocean. 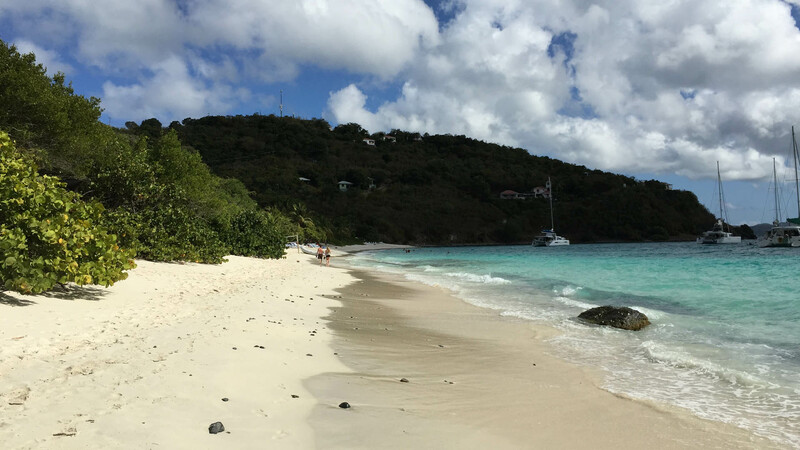 And if you are wondering why we have fallen in love with Jost Van Dyke so spectacularly, here is our answer: it is a stunning beauty, with enough to do, but not too much. Simplicity rules there. It’s where we find our bliss. Let’s see, what to say about Jost (pronounced “Yost,” by the way). 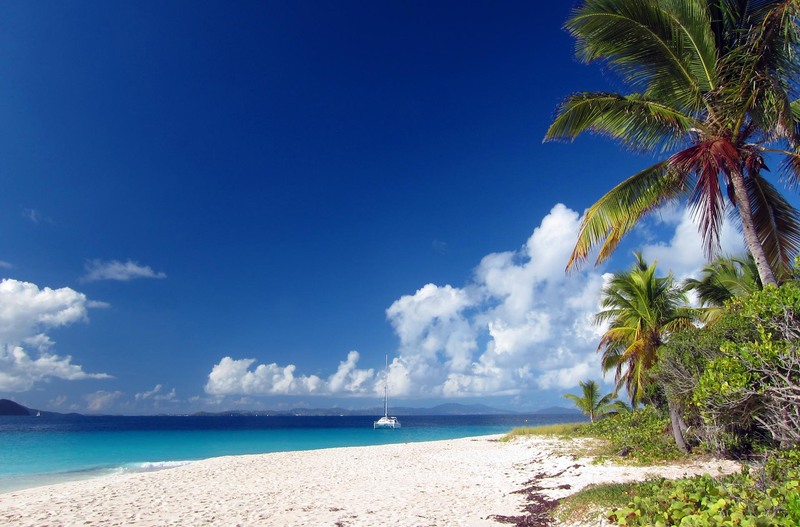 First and foremost, there are no chains on Jost — no chain hotels, restaurants, or rental places. Everything is local. Lovely! It’s hilly, as with most BVIs, so having a jeep is useful. This is the first year we didn’t have wheels, so we spent more time walking or in cabs, which was more cost effective (and healthy). Rental jeeps can cost upwards of $60/day. 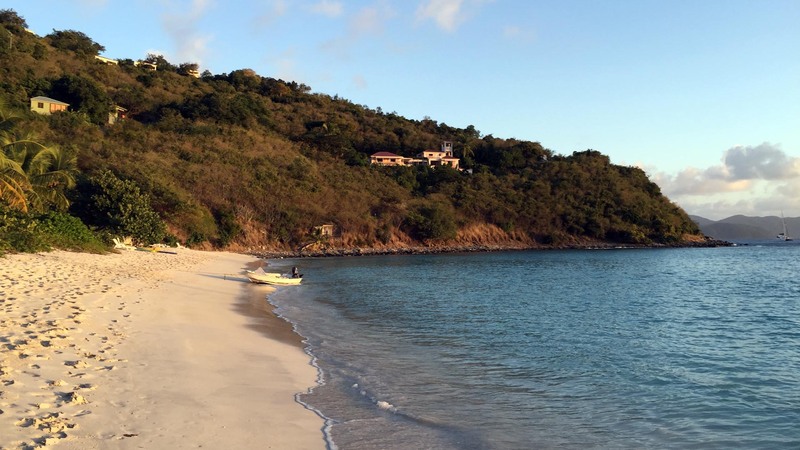 Conservation is huge on Jost. It’s a small island with simple infrastructure so everyone is tasked with keeping the ecosystem intact and functioning. 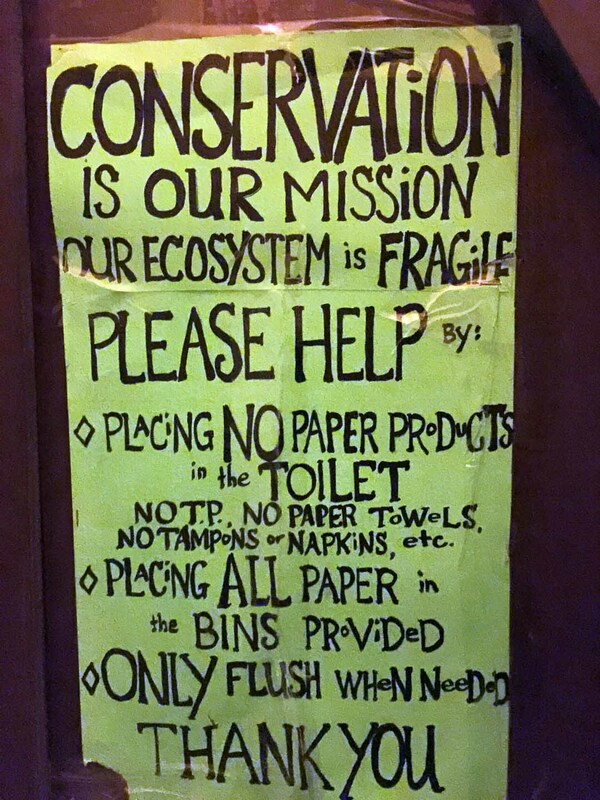 Thus, there is no flushing of toilet paper on the island (the sign to the left was taken in a Foxy’s bathroom). Their simple infrastructure is one of the things that keeps me hopeful that this island won’t be commercialized too quickly. They have a long way to go before that happens. Despite their best efforts, part of the ecosystem is dying — and by that I mean the coral reefs. As you’d expect anywhere, the more boats that come into a bay (whether moored or anchored), the more the reef suffers. For that reason, the snorkeling isn’t great on Jost (or in the BVI’s full stop) in my opinion. To see some of our snorkeling pictures from previous trips, visit here. On a different note, we learned a bit more about the critters that live on Jost this year. Apparently, there are tarantulas and scorpions on the island. We’ve never seen anything of the like (our viewings have been limited to birds, geckos, goats, cats and dogs), but apparently they exist. I must say, I’m intrigued. And if I ever see either, I’m fairly certain I’ll need a new pair of shorts. 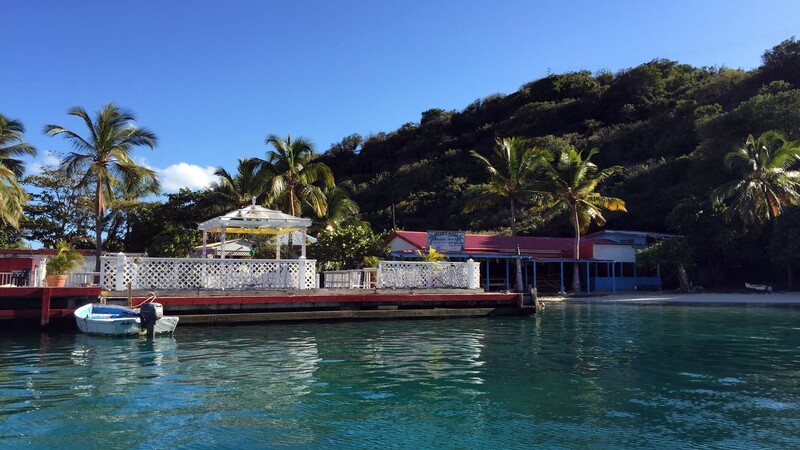 Of all of Jost, our favorite place is White Bay. During each of our visits, we have stayed at White Bay Villas and wake up to this stunning view. No wonder we come back! 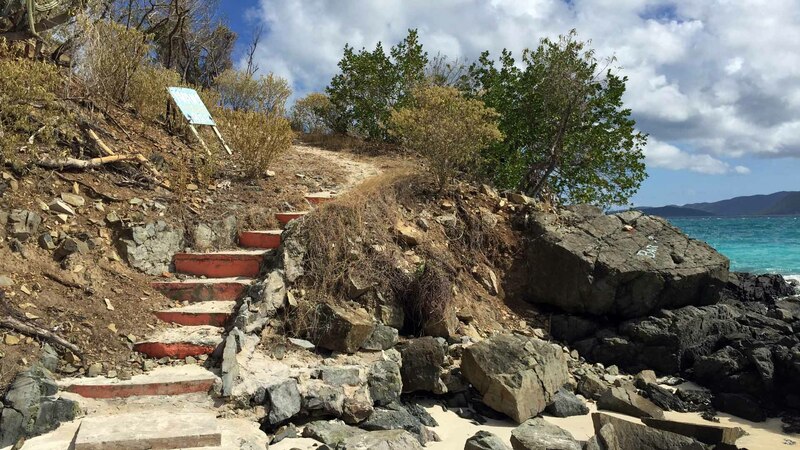 To orient you, White Bay consists of two white sand beaches separated by a rocky outcropping. The beach in the background is the “Soggy Dollar Bar side” (since Soggy Dollar Bar is there…) and the beach in the foreground is the “Ivan’s Stress-Free Bar side” (can you figure out why???). We consider the Ivan’s side as “our beach” since it is quieter and more laid-back. It is a quick downhill trek from our villa. The side of the beach that houses the Soggy Dollar bar is the most active part of White Bay, and likely the most active part of JvD altogether. …followed by Gertrude’s restaurant and bar. Gertrude’s supposedly serves the tastiest chicken roti on the island, but we can’t confirm since we haven’t tried it yet. Maybe next time! And next to Gertrude’s is the famed Soggy Dollar bar. 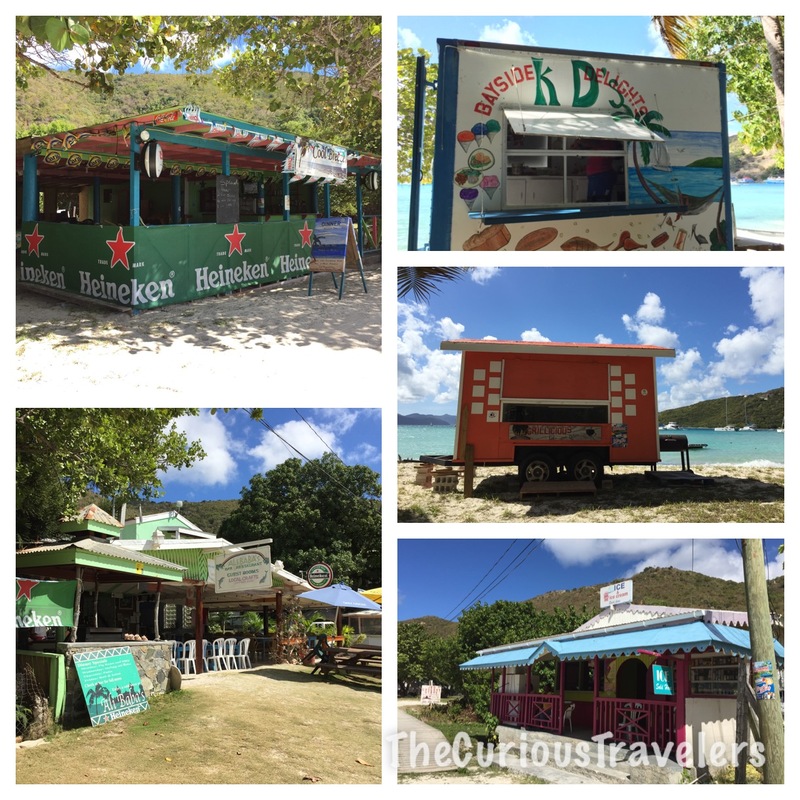 Soggy Dollar is undoubtedly the most popular attraction on Jost Van Dyke. 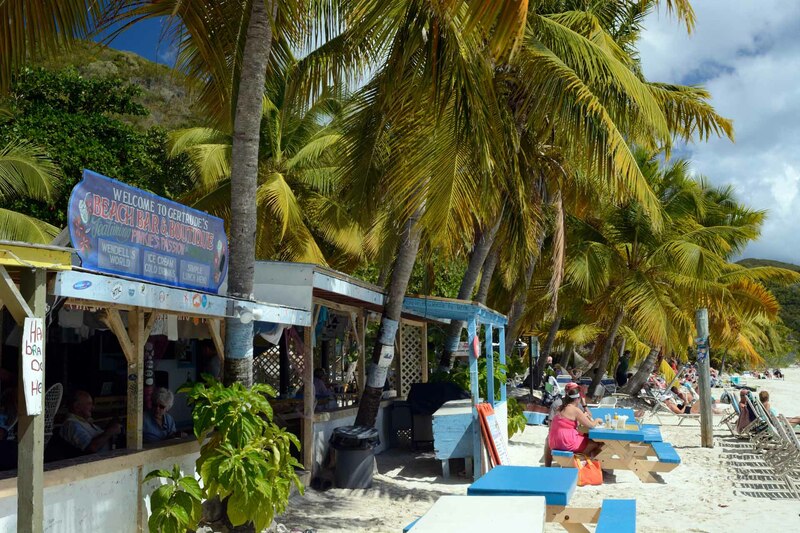 It is an open air bar that is popular for day trippers from other islands. It got its name from the folks who would come ashore from sailboats, paying for their tasty beverages with soggy dollars. Their most famous concoction is the Painkiller, a deliciously tropical mix of dark rum, coconut milk, pineapple and orange juices, and freshly grated nutmeg. Tasty! The view below is from Soggy Dollar. It’s not uncommon to see this side of the beach packed with people and boats from about 10:30am to 3:30pm. After the daytrippers leave, it quiets down. If you want to visit but don’t like to fly, take a look at Soggy’s webcam. This side of the beach has a very Margaritaville kind of feel to it. Drinking, tanning, and carefree frolicking ensue daily. For those seeking solitude over partying, walk a couple of minutes down the beach to the rocky outcropping. The sign below beckons you to the more laid-back Ivan’s side of White Bay. Wear sandals to protect your feet on the short but rocky trek. A quick trip across the rocks brings you out to a much less crowded beach. And herein lies one reason we love White Bay so much. Depending on our mood, we can hang out with everyone or no one. Perfect! 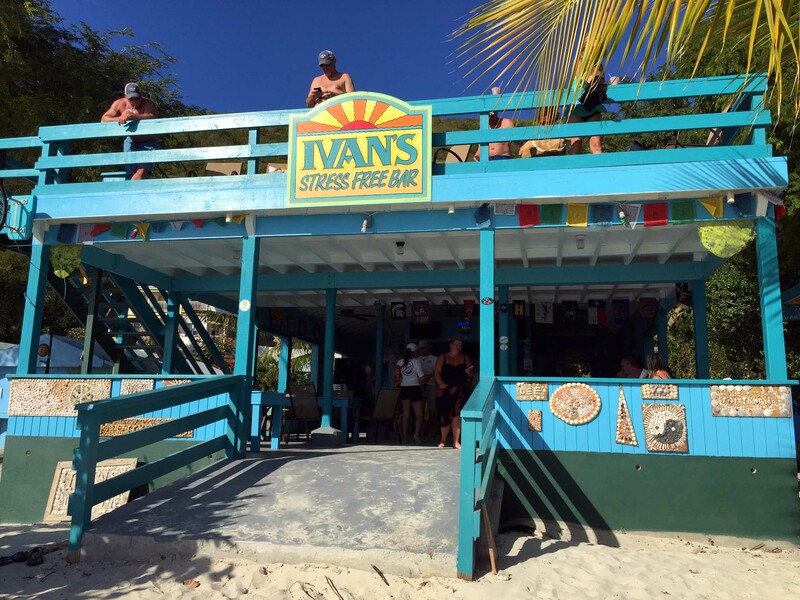 The most popular (and only) action on this side of the beach is at Ivan’s Stress-Free Campground and Bar. Ivan’s has been under re-construction the last several years we’ve visited, but now, the new and improved Ivan’s has been unveiled. Ivan’s draws a completely different crowd than Soggy Dollar. That said, they are each perfect at being what they are. Something for everyone. In the picture below, it’s easy to see how quiet it gets after the daytrippers leave. But importantly, the green villas in the upper left are the ones we stay in. Mmmmmmm. Gorgeous view! Ok, I could go on about White Bay forever, but alas, I will not. Let’s go over the hill to Great Harbour. Great Harbour is the next bay over from White Bay. The ferries from other islands dock in Great Harbour, thus meaning there is more to and fro action here. And not that you can tell based on the picture below, but the main street that lines the beach at Great Harbour is filled with wooden-planked, open-air restaurants. These restaurants are hidden in and amidst the palm trees, making for a quaint walk down the main street. And below are some familiar sites on the main street in Great Harbour. 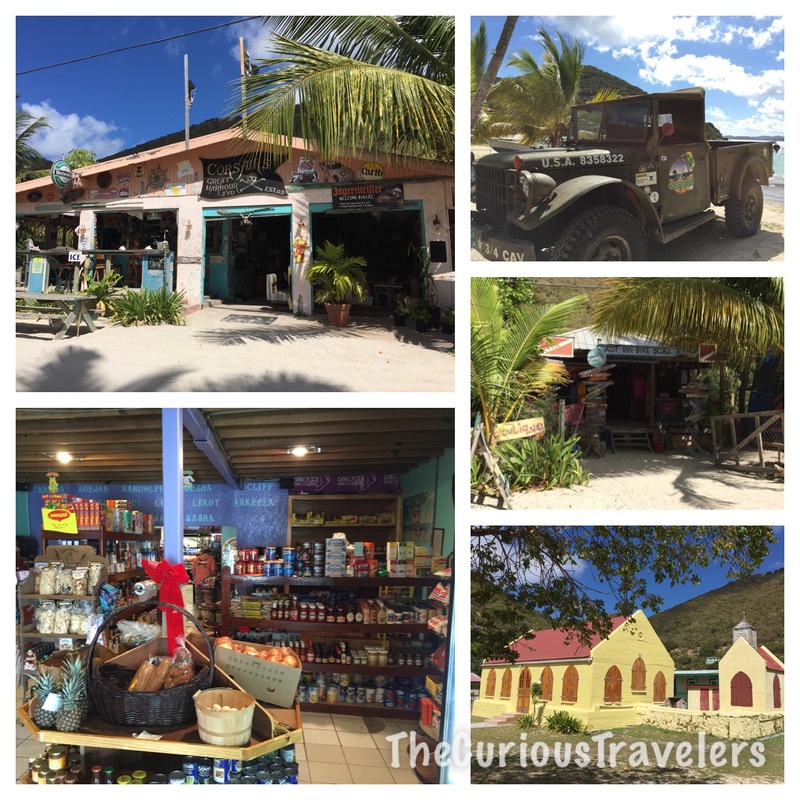 Clockwise from the upper left: Corsair’s restaurant, owned by Vinny the Harley owner, Vinny’s military truck for Corsair’s, Jost Van Dyke Scuba shop (great for day trips), the United Methodist church, and Rudy’s grocery store. Continuing on main street are a variety of restaurants and food trucks. Clockwise from the upper left: Cool Breeze, Bayside Delights, Grillicious, the Ice Cream Shop, and Ali Baba’s. Depending on your mood, any of these can fill your hollow spot. But undoubtedly, the most famous bar in Great Harbour is Foxy’s. “Foxy” Callwood is a JvD institution — it is common to see him sitting in a chair off to the side of his restaurant, guitar in hand, barefooted, talking to customers, singing a tune, or just taking in the scene. When you talk to him, he’s equal parts softspoken and wise, utterly mellow yet meaningful. I enjoy hearing his stories…and he has many! 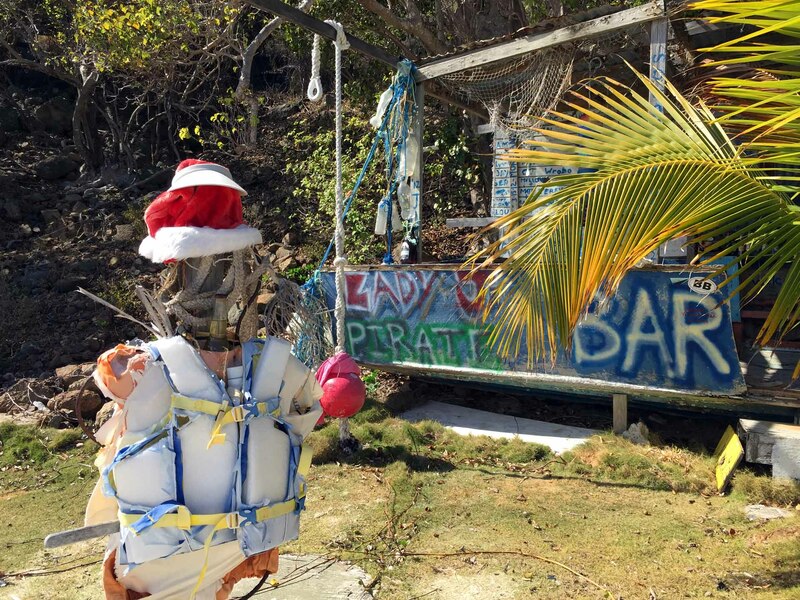 Foxy is a proud supporter of the island, and both of his bars (Foxy’s and Foxy’s Taboo) hold events throughout the year that are famous among the BVIs –the Wooden Boat Regatta, Old Year’s Night (OYN, Foxy’s version of New Year’s Eve), and Thanksgiving and Christmas events. And from what we learned on this trip, Foxy will be unveiling some new opportunities soon (think: night kayaking and boat trips exploring Jost), but we’ll have more on that in a later post. Until then, let’s go check out Little Harbour. That said, Little Harbour is a small, quaint bay that is well known by sailors — so reservations are required. In fact, it’s best to make reservations in advance for any dinners you plan to eat out in Jost. Since the restaurants are small and demand varies daily, it’s best for the restaurants to know how many to expect on any given night. The bubbly pool is a small pool situated towards the northeastern edge of Jost, where waves crash thru a gap in the rocks to form a pool. The waves make it bubbly, and the undertow can sometimes make it dangerous. People have died there. We checked it out our first year, but haven’t been back since. 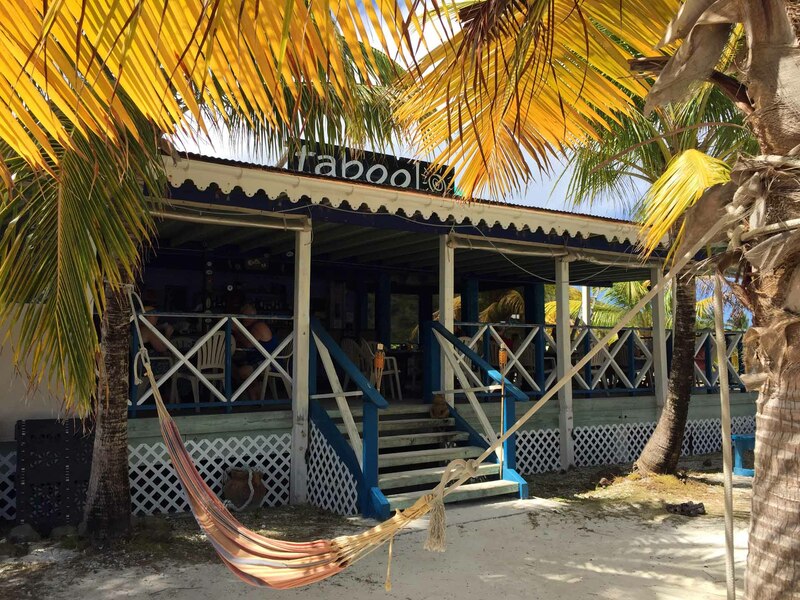 Our favorite part of Diamond Cay is Foxy’s Taboo — a restaurant overlooking the water. Jeff and I both love the food and the atmosphere. People only find Foxy’s Taboo if they are looking for it, so it’s off the beaten path for the average daytripper. Here is the view from Foxy’s Taboo. Not too shabby, eh? 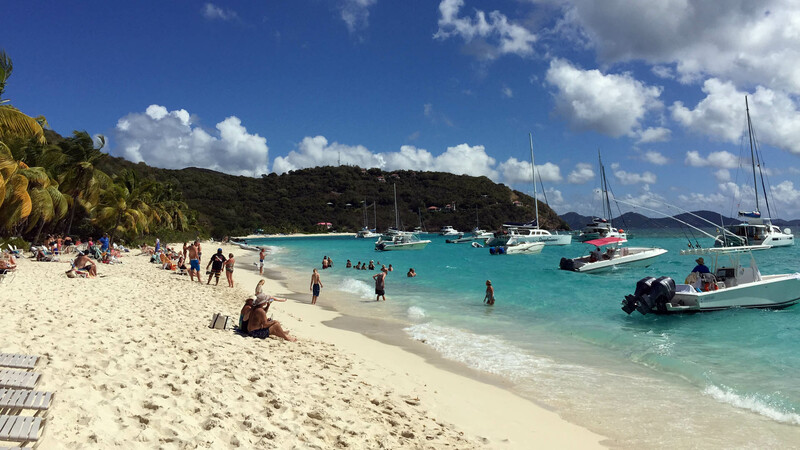 The hill in the background is Little Jost Van Dyke…our next stop. 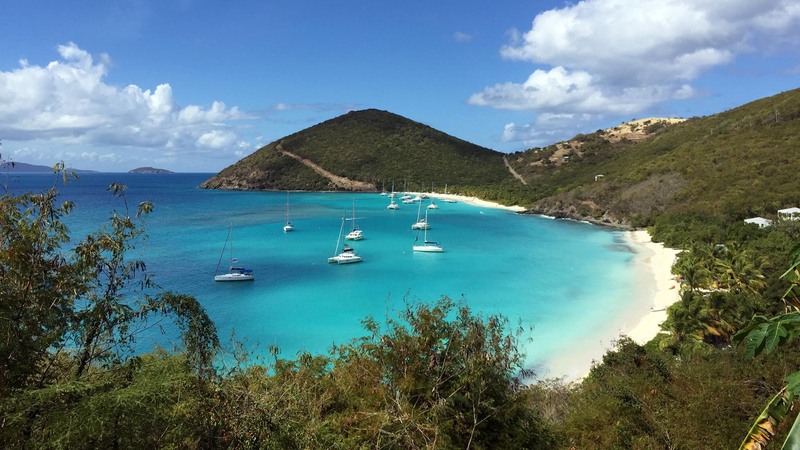 Little Jost Van Dyke is aptly named. It’s a smaller version of Jost. Why on earth would you go walking through brambles instead of chilling on these beaches? Just doesn’t compute with me. And one bay over from the B-Line bar is a small beach that houses a unique “bar” of sorts. At some point in Little JvD’s history, someone thought they would bring a wooden boat up onto the beach and make it a bar. It didn’t work, but the boat remains. And every year we visit, there is more to it. This is the first time it’s been painted and named Lady J’s pirate bar. The beach “scarecrow” has also grown in the last several years. It first looked like Wilson from Castaway, but now has a life jacket, Santa hat, and a full bottle of Corona. Around to the south from Little Jost is Sandy Spit. Sandy Spit is the epitome of a deserted tropical island. You can only get there by boat and in all of our visits, we’ve arrived by dinghy. We typically rent a dinghy for a day from a local, so that we can explore these outer cays. This is Sandy Spit on a more crowded day. Given the number of people, we didn’t stop. 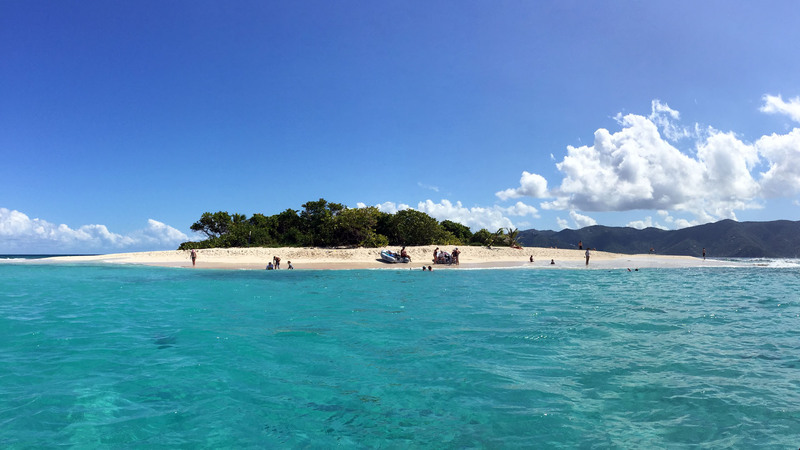 Yes, I know that sounds ridiculous, since there are about 10 people here, but Jost is one of those places where you really can find an awesome beach and have it all to yourselves. So that’s what we aim for, every time. And possibly the pentultimate in gorgeousness is Sandy Cay. If Sandy Spit wasn’t the epitome of a deserted tropical island, then Sandy Cay certainly is. This is the first year we’ve been able to make it over to Sandy Cay, so we were excited. We had a perfectly calm day that allowed us to dinghy over without a problem. Ummm, I’m not even sure what to say here. Ridiculously gorgeous. And here is the view of Sandy Cay as we rode away. Again, there are nature trails for hiking around the island. 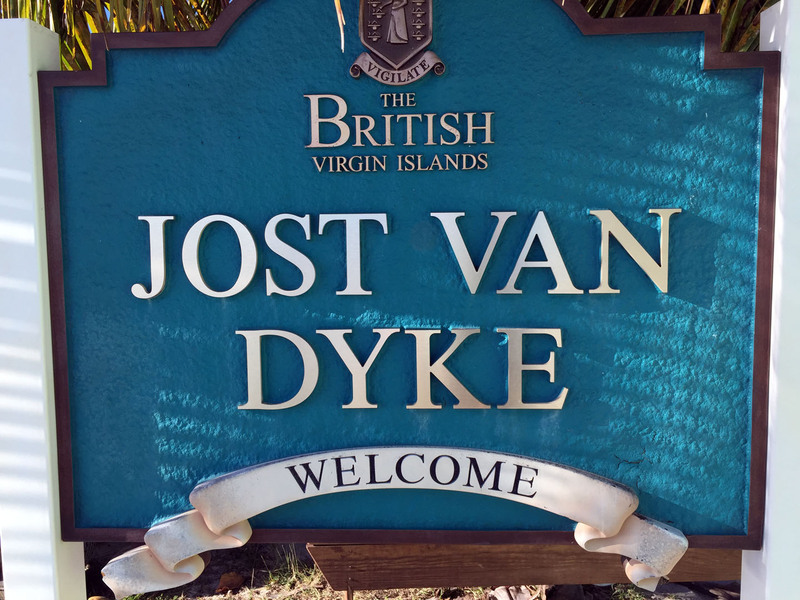 Well, that about sums up Jost Van Dyke. We’ve been gone for 3 days now and I already want to go back!!!!! We hope you’ve enjoyed this re-introduction to our favorite island (oh, wait, 2nd favorite island — the Southern Island of New Zealand will always be the first!!!). Hello stranger!!! So GREAT to hear from you! And don’t you worry — we are still fully supporting both UNC and the Black Caps (matches are on day and night here, it seems!) And I am so jealous of you right now–I would kill to be back in summer. It’s frigid here and I don’t want any part of it! Hope you’re doing well!!!! Thanks for your first comment 🙂 Always great to hear from you!